Art Nouveau at Pontefract Museum MuseumPontefract Museum was built in 1904 as a Carnegie public library in the art nouveau style; this building still has many of the original fittings. 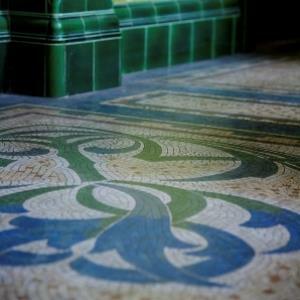 Beautiful tiles decorate the entrance and staircase, with intricate door handles and matching chairs. If you like the art nouveau style then this building is un-miss able. Art Nouveau was based on natural forms and curved lines, found in plants and flowers. Pontefract Museum is a great example of this with beautiful plant motifs and grand curves. Pontefract Museum was built in 1904 as a Carnegie public library in the art nouveau style; this building still has many of the original fittings.